J&J offers standard and safety slope end sections ... in galvanized and aluminized steel, and aluminum ... round and arched ... in a variety of slopes and sizes – from 6” to 96” in diameter. Standard end section slopes range from 1.5:1 to 2.5:1. 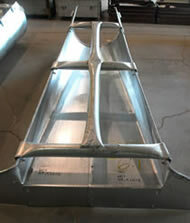 Safety slope end sections are available in 4:1, 6:1 and 10:1. J&J offers the widest selection of end section slopes in the world! Our custom-made Trumpf machine, designed specifically for J&J, offers one of the largest platforms of any cutting machine in North America. Computer-controlled verification ensures exacting 100 percent consistency, providing precision and uniform fit time and time again. 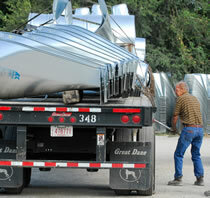 J&J, a family-owned company, has been serving the culvert industry for more than 60 years. Our quality, consistency and customer service have made us one of the most trusted, reputable manufacturers of end sections, accessories and corrugated steel products in the industry. J&J products undergo real-world testing ... testing for safety ... testing for hydraulic efficiency. The result is that J&J products consistently meet – or exceed – critical requirements set by federal and state transportation agencies. J&J was the first in the nation to develop the safety slope end section that significantly reduces hazards to motorists. J&J products are made from certified materials that meet AASHTO and ASTM standards and the Buy American Act. American-made bolts are used in place of welding in many cases for greater strength. “Trumpf” machine consistency ensures a uniform fit. Experienced, long-term personnel offer superb workmanship to meet J&J’s high standards. It all adds up your assurance of certifiable quality. In addition to speedy turnaround, our responsive sales/service representatives establish long-term relationships with customers, and become involved in helping solve problems. You’ll always deal with the same representative at J&J! Our delivery personnel are knowledgeable about products and can assist with installation questions. Need a product with unique specifications? J&J can accommodate. We ship from stock that we maintain on-site, so there’s no waiting for delivery from a distributor. Your order is sent by the speediest, most efficient means possible. In many cases, J&J products are shipped on J&J trucks. It is the same today as when we opened our doors in 1946. And that commitment has earned us a sterling reputation throughout North America. As a family-owned company, we remain strongly committed to providing our customers with the best in quality products and customer service, and to meeting the challenges of the future.